The Baselworld Event always sparks wide interest in the watch community. Baselworld 2008 was no different, though the Rolex community was particularly abuzz. Along with 2008 being the 100 year anniversary of the founding of the Rolex company, Rolex also made some fairly significant announcements and released several new watch designs. Among the new releases, Rolex quietly and unexpectedly debuted three all-gold Rolex Submariner models. What made these new Submariners unique and exciting was the fact that they were not variants of existing Submariner models. Rather, they were completely re-designed watches. The new all-gold Submariners, including the white gold model with reference 116619, exhibited many of the same enhancements and upgrades as the highly anticipated Anniversary GMT models. The lugs and the crown guards on the 116619 share the same expanded design also the 50th Anniversary GMT. Because the lugs and guards are larger, the Submariner appears overall larger on the wrist, though the dial remained the same 40mm measurement as in previous Submariner models. 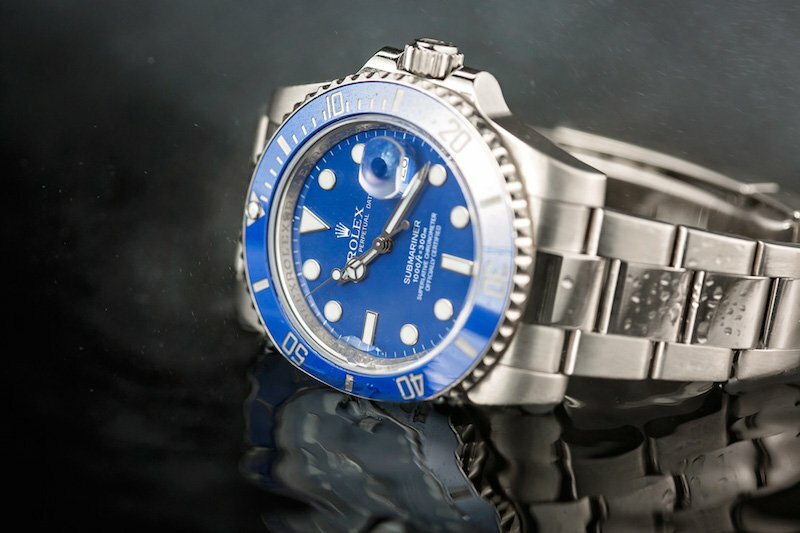 Other features helped the 116619 remain uniquely Submariner. For example, the Cerachrom bezel, made of an extremely hard and highly scratch resistant ceramic, strikingly resembles the classic Submariner bezel style. The 18k white gold case of the Submariner 116619 was not increased in size to accommodate higher water resistance. Rather, the Submariner 116619 remained at the same water resistant level of 300m as the previous model. The Submariner 116619’s dial raised many eyebrows when first revealed. Its striking robin egg blue color was a surprising choice for the watch. However, the color compliments the white-gold beautifully. The dial also features larger markers and hands, first seen on the Rolex Yacht-Master. The hands have also been lumed, which glows a beautiful and complimentary blue. The bracelet and clasp of the 116619 Submariner were also upgraded. Matching the 18k white gold of the case, the Submariner 116619’s white gold Oyster bracelet features solid, highly polished center links. A new Glidelock clasp was introduced on this watch, upgraded to require no tools to adjust the bracelet to the clasp, making it far more functional than previous models. 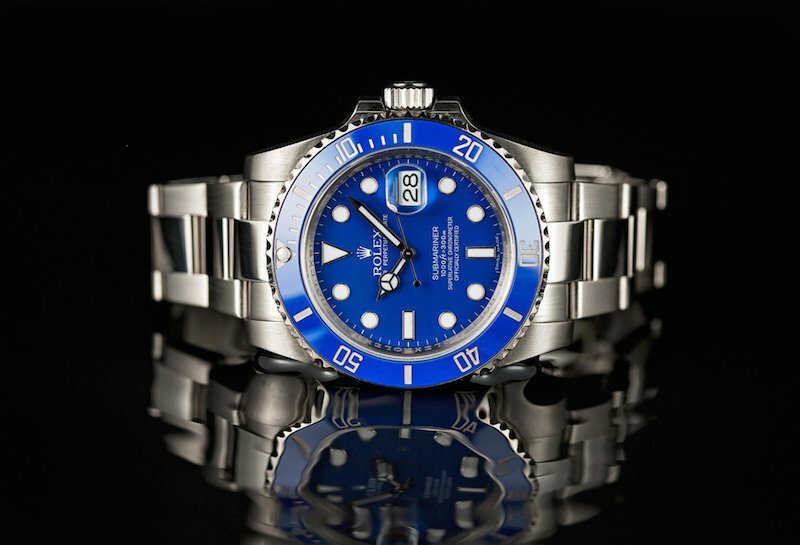 This Submariner is a beautiful masterpiece that created tons of buzz from Baselworld. 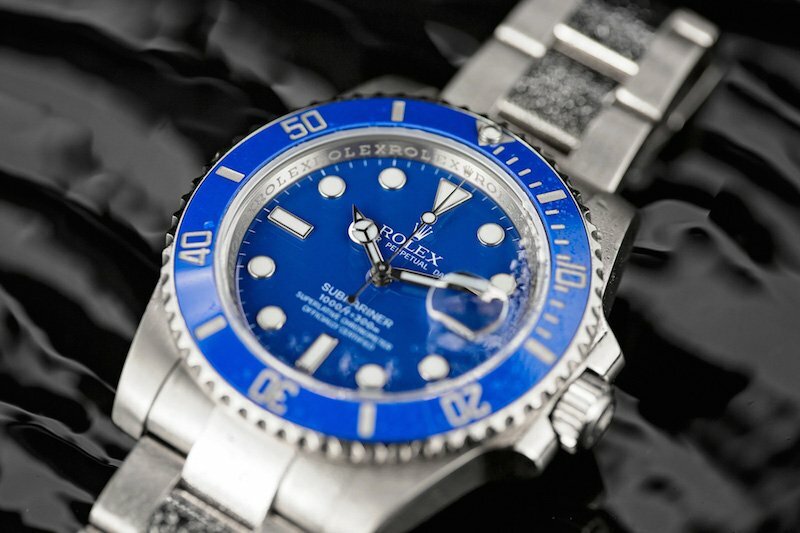 Rolex did not stop its upgrades to the new Submariner 116619 on the outside. Inside, the 116619 uses the 31 jewel Rolex caliber 3135. The movement oscillates at 28,800 beats per hour and has been COSC tested and certified. However, a slight adjustment was made to the tried-and-true caliber 3135 of the 116619. The caliber is fitted with a new “Parachrom Blue” hairspring, specially designed to be almost completely anti-magnetic as well as highly shock and temperature resistant. This greatly aids in maintain the precision of the timepiece, giving it the reputation as one of the most reliable watch movements. The Rolex Oyster Perpetual Submariner reference 116619 is a very valuable collector’s piece, valued at around $29,850. Not only are its white gold case and blue dial aesthetically pleasing, but the technical specifications of the Submariner 116619 were greatly improved. With models such as the 116619, it is not surprise that the Submariner line will continue to shine as the epitome of a luxury diver’s watch.